Luis Valdez, the iconic Chicano playwright and director behind Zoot Suit, La Bamba and El Teatro Campesino, stages the world premiere of his latest work, Adios Mama Carlota, The Empress of Mexico. 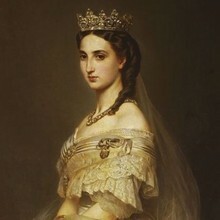 Empress Carlota--daughter of King Leopold I, King of the Belgians--inherited her title after marrying Emperor Maximilian I of Mexico (later executed in the country Napoleon III had entrusted him to rule). The play is narrated by Carlota, 60 years after she fled Mexico to Europe in a failed attempt to save her husband's crown and his life. The production runs through April 28.